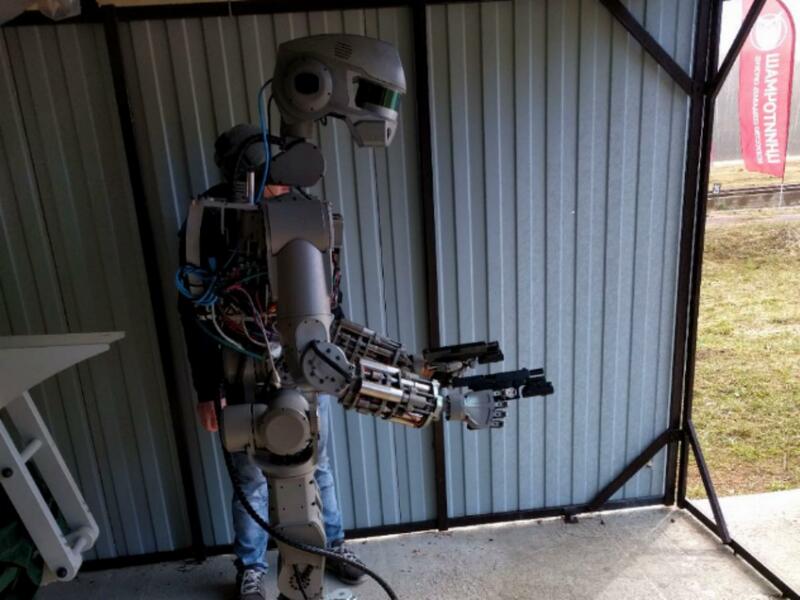 Russia’s space-bound humanoid robot FEDOR (Final Experimental Demonstration Object Research) is being trained to shoot guns from both of its hands. The activity will help improve the android’s motor skills and decision-making, according to its creators, who have also tried to address concerns that they’re developing a real-life Terminator. “Robot platform F.E.D.O.R. showed shooting skills with two hands,” wrote Russia’s deputy Prime Minister, Dmitry Rogozin, on Twitter. Mr Rogozin was reported to have shot himself in the foot back in 2015, shortly after tweeting support for America’s National Rifle Association, though a spokesperson from his office said he hurt himself while playing handball. FEDOR is expected to travel to space in 2021, and could be the only passenger on board Russia’s Federation spacecraft when it does so. It’s being developed by Android Technics and the Advanced Research Fund, and has been taught a wide range of advanced skills. It knows how to use keys and a variety of tools, screw in light bulbs and even drive a car. The robot was originally created for rescue work, but military uses have also been suggested by engineers. A number of experts have issued warnings about robots and artificial intelligence over recent months. Lord Martin Rees, the Astronomer Royal and Emeritus Professor of Cosmology and Astrophysics at the University of Cambridge, earlier this month said that machines could take over from humans within a few centuries. He also said he believes that alien intelligence, if it does exist, could be “electronic” and far better suited to space exploration than humans will ever be.